© The Costume Gallery 1996-1998. WHY? Because so many costumers around the world have given me knowledge without charge, so I am sharing the wealth (knowledge). As a child, my mother used to sew for her eight children. Trying to save money, she would rip all the seams out of our old clothes for a pattern. I knew there had to be an easier way to make patterns and save clothing. I learned how to achieve this, computerize it and give my first creation to you. Thank you to Mom (my first teacher), Elizabeth Weiss-Hopper, the Valentine and the h-costume mailing list. Disclaimer: No garment was harmed in process of making this pattern. This pattern and directions may be printed from the internet for use. Please respect my copyright on this pattern. 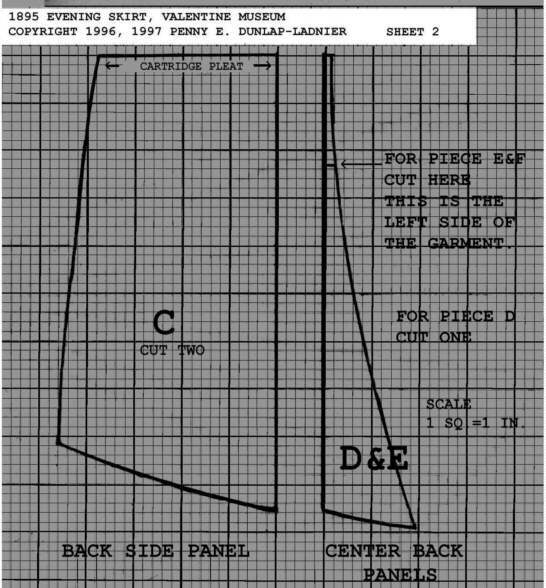 If the pattern is reproduced in any manor other than for educational purposes or personal use, written permission must be obtained from The Costume Gallery. © The Costume Gallery, 1996-1998. The original garment is located in the Valentine Museum in Richmond, Virginia. 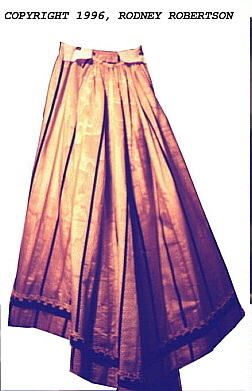 The date of origin is 1895 and was used with a matching bodice as an evening gown. 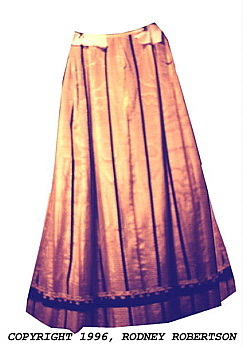 The gown was made in a gold and black striped moire fabric. 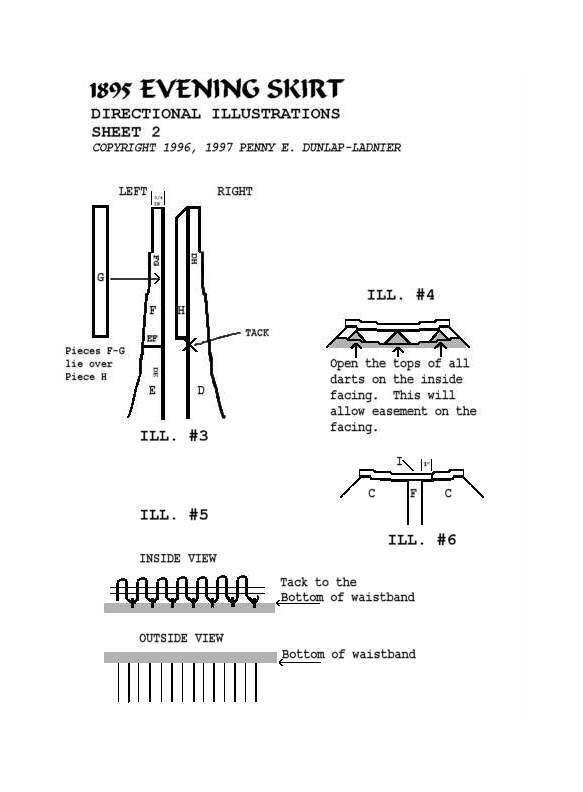 Some of the methods of construction are not typical methods used during this period. 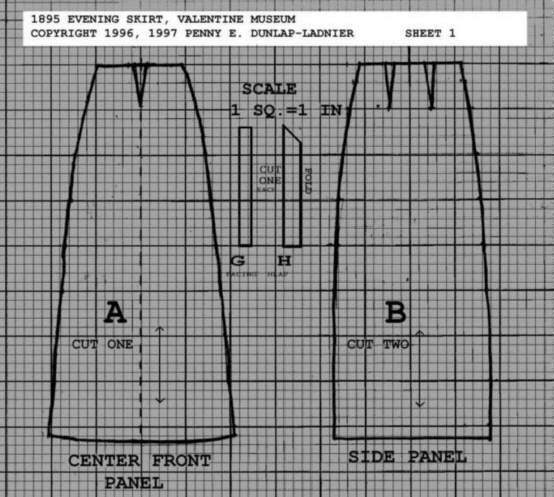 Examples of this are: The waistline facing is actually the top of the skirt turned over to the inside skirt. 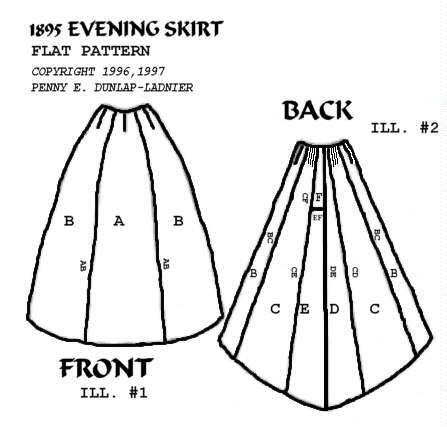 This means you must add 1 1/2" to the top of each skirt pattern pieces. Also, pay close attention as to how the cartridge pleats are attached to the waistband. It can be tricky. Follow the directions and illustrations carefully. Use a lightweight muslin to construct a mock skirt first. This will allow you to make mistakes and not lose a lot of money. Lightweight muslin is inexpensive and easy to work. When constructing your final skirt, use a lightweight fabric ONLY. The method that is used for attaching the cartridge pleats will not work if you use heavy fabric. Also, the back of the skirt is very heavy. Heavy fabric will cause great stress to you and the garment. When wearing the skirt, wear a bodice that you can attach the skirt to. Use pens or hook & eyes to do this. It will distribute the costume weight evenly.